Incorporated in 1991, the Gold Standard (GS) was founded by Dr. Brett Ferdinand, M.D. - who scored in the 99th percentile in the Medical College Admission Test (MCAT) and who has published MCAT books and developed multimedia learning materials. Surprisingly, in the late 1990′s/2000′s some GS MCAT books, videos and practice tests found their way to Australia being used as a non-specific preparation for the GAMSAT. While on vacation in Australia in 2009, Dr. Ferdinand was invited to give his opinion on how to prepare for the GAMSAT before an undergraduate science student group at the University of Sydney. The warm reception served as a catalyst to assemble a team of university professors, arts/science and medical degree graduates to create the first textbook to be published for the GAMSAT: The Gold Standard GAMSAT. As a team, we continuously study the GAMSAT and conduct research and surveys in order to create the most helpful and representative GAMSAT revision materials available. Through our videos and live courses, GAMSAT students have found that we can teach in a way as to make challenging concepts easier to understand. The purpose of our multimedia approach – textbook, video, mp3s, apps, online materials, etc. – is adaptability. We understand that students learn differently and have varied academic backgrounds. We make tools available so that you can choose to learn according to the way you learn best. The Gold Standard GAMSAT is the first GAMSAT textbook ever written. 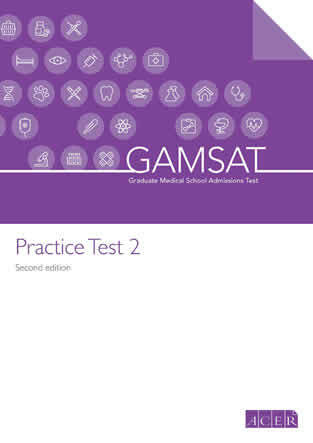 This meant that for the first time ever, students need not ′gamble′ on GAMSAT preparation. They could walk into their university bookshop and browse, read and decide. Suddenly, one hardbound book in colour covering all 3 GAMSAT sections replaced the 6-10 books that students were often using. We are also the first to bring problem-based learning – the current method of teaching at most medical schools worldwide – to GAMSAT teaching at campuses in Australia, Ireland and the UK. Using GAMSAT-style practice questions and keeping everyone in the class involved – irrespective of academic background – optimises the learning experience for everyone. We are the first and only company that has a complete playlist of the Section 3 worked solutions to all of ACER′s GAMSAT booklets, viewable for free on YouTube. In what is simply unprecedented, we produced more than 100 free educational GAMSAT videos with helpful step-by-step explanations, available to all. 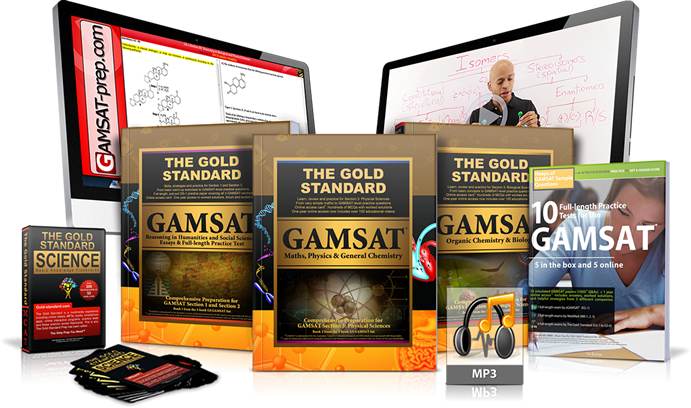 The Gold Standard GAMSAT is the first to offer GAMSAT Flashcard Apps for Android and iPhone, science review videos (both online and DVDs), MP3s, interactive online practice tests with scaled scores, live free monthly webinars, free GAMSAT Question of the Day, and still, there will be more ′firsts′ to come. After 4 years in publication, The Gold Standard GAMSAT textbook won its first International Book Award in Reference/Education. There was no question of resting there. Our new 2016-2017 edition has hundreds of more pages, hundreds of more practice questions and more online features. We never just reprint a book and claim that it′s “a new edition“. Likewise we are also moving forward with new content for our GAMSAT videos, flashcards and apps. It′s not just about study materials, it′s also about customer service. We have live online customer support as well as email support - learn@gamsat-prep.com. We also have regional phone contact centres to follow up purchases in Australia (612-8005-0922), Europe (44-845-458-9911), and North America (1-866-333-3138). If something went wrong with an item that you bought from us, we are available during business hours to answer your concern. We can also receive queries through our GAMSAT-prep Facebook page. Of course, if you have study questions, our GAMSAT Forum is a great venue to post so you are not left in the dark with any aspect of your review.